Know more: Martin Luther King, Jr. Does it take 2500 demonstrations/speeches and sacrificing ones life to bring about equality to the disadvantaged/discriminated people? That’s exactly what it took for Martin Luther King, Jr. to initiate the end for the racial discrimination against African-Americans in the US. Why is the Martin Luther King, Jr. day, the only federal holiday (in US) to be declared honoring a person? What does it take to win the Nobel peace price at 35? Isn’t that true even (and especially) today? Though Martin Luther King, Jr. (referred to as King henceforth) started his career in the religious field, he was highly influenced by the teachings of Howard Thurman and M K (Mahatma) Gandhi. During his time, African-Americans had separate schools, limited employment opportunities, housing restrictions, and what not. He found his life’s calling as a reformer and took up the life-long struggle for ending the discrimination against American Blacks. The way in which King chose to fight the oppressors made the path as divine as the end he was seeking. He committed himself to non-violent principles and chose to resolve disputes through dialogue, demonstrations and inspiration. He chose to bring awareness in his enemies instead of wanting to defeat them. In 1955, when a woman called Rose Parks refused to give up her seat in a public bus (to a white person, as required by the law then), she was arrested and that inspired King and his supporters to organize their first campaign – The Montgomery bus boycott. It took 385 days, threats, prison and humiliation before a court ended the racial segregation on Montgomery public buses. That was his first victory and proof that non-violence was a potent weapon to fight with. In 1957, King and his colleagues founded the SCLC (Southern Christian Leadership Conference) through which they fought for desegregation, right to vote, equality of labor/jobs and various other civil rights for the African-Americans. For instance, they fought the segregation laws (in schools, departmental stores, public places, etc) by breaking them and provoking arrest. He was arrested multiple times during various campaigns and his supporters were dismissed using police force. But that only ended up creating a further resolve in him to keep fighting. Some of King’s nation-wide campaigns were successful and others were not. But his spirit was never diminished due to the results. In 1963, King and his colleague Bayard Rustin organized a march on Washington demanding an end to various discriminatory practices. Not less than 250,000 people marched with him and King gave his famous, ‘I have a dream’ speech, which is considered as one of the best speeches given in the United States history. King publicly opposed the pointless Vietnam war that America was fighting back then. He felt that the funds used for war could have been used to improve the living conditions of the poor and public welfare schemes, instead. No wonder the press was actively used against him during this period. During his last few years, King was fighting poverty and war in addition to racial discrimination. He found them all interconnected and struggled to achieve universal brotherhood among people belonging to various races and various economic classes. King spent more than 13 years actively fighting for civil rights and many of them were enacted into law with the introduction of Civil Rights Act (1964) and Voting Rights Act (1965). Martin Luther King, Jr. was shot when he was 39 while standing in the balcony of his hotel rooms during one of his campaigns. In a few days following his death, the US Congress passed the Civil Rights Act of 1968 which ended various discriminative practices against African-Americans. King was the first Non-President to get a memorial in the National mall area of Washington D.C. He was posthumously awarded the Presidential Medal of Freedom (1977) and Congressional Gold Medal (2004). King was voted as the sixth best person of the century in a poll conducted by the Time magazine in 2000. 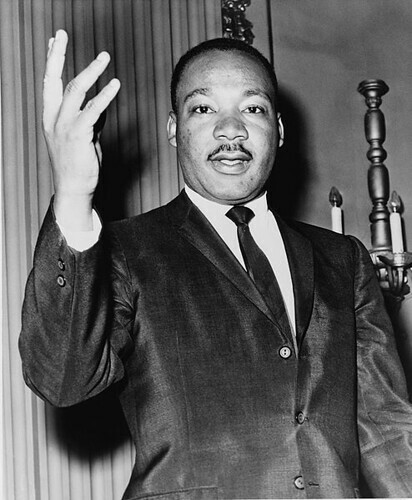 Life history: Wikipedia article on Martin Luther King, Jr. Image source: Wikimedia Commons, Copyright free image. “I have a dream” ……. those words are the biggest inspiration, the best of all times. Thanks for sharing. I am yet to read that speech. Thanks for reminding me, I will now link it from here. Dreams.. Dream t omake the dream come true.. I could enrich myself. Thanks. Yes. Even his Nobel prize acceptance speech (some quotes given in this article) is excellent. You should listen to the original audio if you get time. It’s highly inspiring! I had read about Martin Luther King long back. Have seen a movie about him, don’t remember the name, though. Felt nice reading about him again. We badly need a leader like him now who can clear all the dirty problems in our country. One of the most inspiring leader of all time! His words are very motivating. I have a dream – goosebump inducing! Thanks for renwewing his spirit. I am reminded of declamations in school where we would all choose some amazing speeches – like Nehru’s Tryst with destiny, the Gettyburg address, the one from MacBeth, Friends,Romans and Countrymen from Julius Caesar – speeches can never cease to amaze and inspire! Can you listen to these in audio? There was a 30 second original voice exerpt in Wikipedia/Nobelprize.org sites. I am not sure if the full speech is available. The way he speaks is better than the speech itself! Martin Luther King is such an inspiration for me. I read a story about his life and his way of transforming himself by knowing God. Martin Luther King is gone but he remains every people’s heart. Yeah, but we need more people like him to carry on his legacy. Hey, One more well researched post…Thanks for sharing this. Thanks for reading this, I like writing about people whose life is an inspiration to others.